Chairman Brian Lee says the Football Conference will resist the Football Association commission's B-league plan. FA chairman Greg Dyke aims to improve opportunities for young English players by creating a new tier between the Conference and League Two. Lee fears the idea will harm the lower leagues and doubts it will go ahead. He told BBC Radio 5 live's The Non League Football Show: "They're taking the heart out of it. This is a quick fix and it's not going to happen." Dyke's four-point proposal is designed to drive up standards in English football. The most controversial suggestion is to establish League Three, made up of 10 Premier League B teams and 10 Conference sides, from 2016-17. 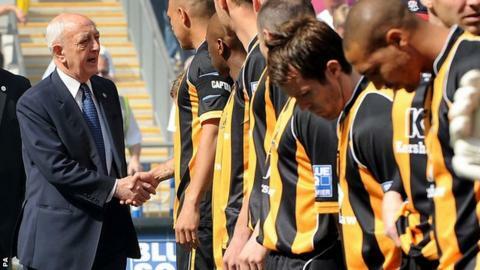 Lee said his organisation, which oversees the Conference Premier, North and South divisions which sit immediately below the Football League, had not been consulted on the plan. He said: "We will resist it, for the pyramid of football - the competitions that feed into the Conference. "The Football Association has lost the plot. At the moment, we don't support it, that's for sure. "I'm not sure that this is the answer but I don't know what the answer is. "At least it's started the ball rolling. We haven't had many alternatives at the moment, including from the Conference." Lee believes leading clubs working closely with lower-league teams and improved coaching were better solutions to raising standards in the English game. He said: "I see a good relationship developing in different ways. For example, there's a good relationship with Hyde and Manchester City, and a good relationship between Aldershot and Chelsea. "We've got a wonderful centre at St George's Park but we need to improve the quality of coaching. "We need some inspiration in the coaching world. We need someone like David Beckham at St George's Park, for example." Listen to the full interview with Football Conference chairman Brian Lee on The Non League Football Show on BBC Radio 5 live at 05:00 BST on Sunday.